arcomed pumps employ the most advanced possibilities and leading-edge standards in intravenous anesthesia (TIVA – TCI). Automated calculation of infusion flow rate, based upon the patient’s biomedical parameters, represents a huge step forward in SAFETY. Why not involve the patient while s/he is awake in decisions about bolus drug delivery, based upon his/her pain perception? Consideration of this factor whilst maintaining the highest safety standards has been our priority in the development of our PCA/PCEA/PCS pumps. Thanks to patient-controlled anesthesia systems (PCA), patients can control how their pain is relieved. Normally, healthcare professionals will prescribe this type of treatment to enable the patient to use arcomed’s devices in order to administer small doses of medication as needed. Infusion pumps by arcomed are set up to administer the prescribed dose of medication in each case. The patient just presses the button on the device in order to release the dose required, whenever he or she is suffering pain. The medication is administered intravenously using infusion solutions by arcomed such as syringes, cannulas, IV sets or oncology sets. Moreover, these systems are suitable for both general ward rooms and labor ward rooms; we tailor our infusion pumps to your specific needs. An air-activated PCA bolus switch for the provision of analgesia in those patients fully conscious but unable to use their hands or upper limbs. 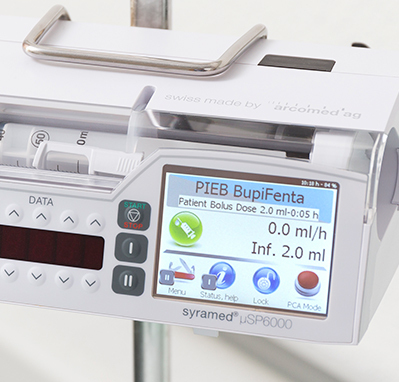 The bolus switch includes an intelligent pressure sensor and disposable tube, with a filter and mouthpiece attached, which is kept close to the patient’s mouth using an articulated arm. To request a bolus, the patient simply has to introduce a continuous amount of air into the mouthpiece. 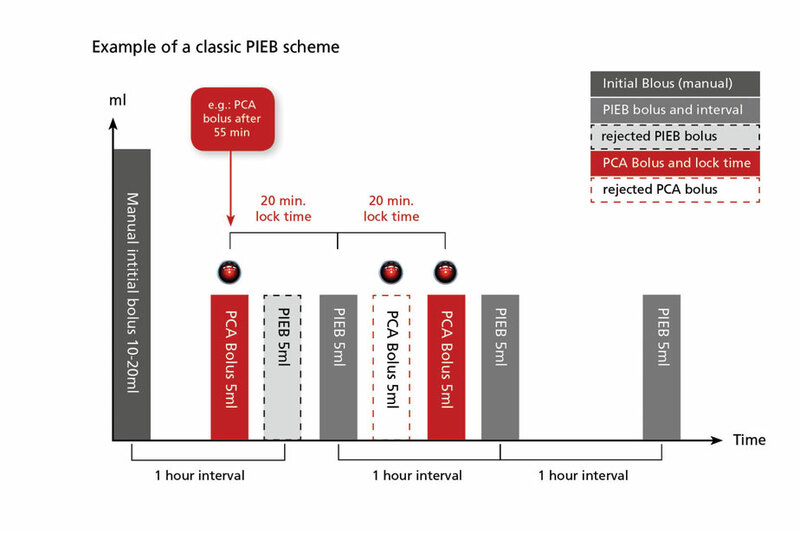 An infusion model based on the latest scientific and clinical evidence for advanced epidural anesthesia that combines intermittent bolus, PCA patient bolus and automatic lockout time limit. This model allows an improved distribution of the local anesthesia in the epidural space which means a higher analgesic bolus effect. It is also possible to enable the option for physician boluses within the lockout time. Reduction of local anesthetic during childbirth. In line with our All-in-One philosophy, arcomed pumps fully support bolus tocolysis protocols, offering pre-defined programs with varying recurrent bolus levels to be used in labor wards – improving infusion safety and simplicity. A brand new certified infusion device for use in hyperbaric environments up to 10 ATAS, avoiding false alarms and the risks of inaccurate infusions under extreme pressure and oxygen conditions.